Couples will grow intertwined with each day of their marriage, just as the trees depicted form a beautiful orchard, sharing good weather and the challenges of life. 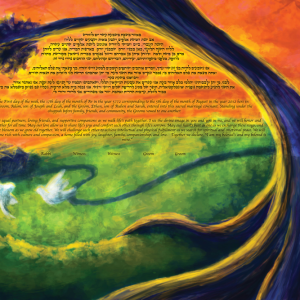 The gorgeous shaded background of the Stained Glass Orchards Ketubah provides a feeling of warmth, joy, and color. L'Chaim! Wassily Kandinsky's Blaue Reiter, it can be argued, created modernity: coming out of nowhere, this group combined new styles and forms in fun and creative ways that are perfect for the creative-traditional couple. Especially those that love Bauhaus. The Floating Forms Ketubah uses geometric forms, primary and secondary colors and simple shapes — just of the sort Kandinsky built is style on. 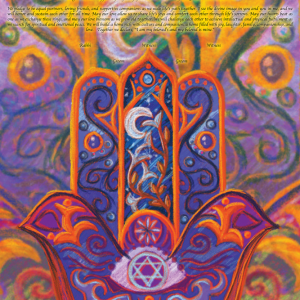 The geometry creates a unique piece of artwork that combines the synchronicity of both theory and practice. “I am my beloved’s and my beloved is mine”—Legend tells us that King Solomon wrote this line in his intimate and beautiful poem, the Song of Songs. 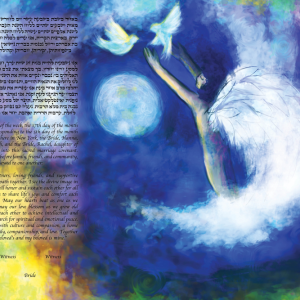 For centuries, Jewish couples have reflected on its lines as an expression for their relationship. 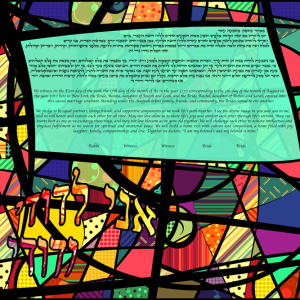 The Ani L’Dodi Mosaic Ketubah combines this classic phrase from Jewish tradition together with the vibrant, exciting, and joyful design of stained glass. Reminiscent of the world’s most famous Synagogues, each pane uses powerful yet subdued colors to illuminate the view. 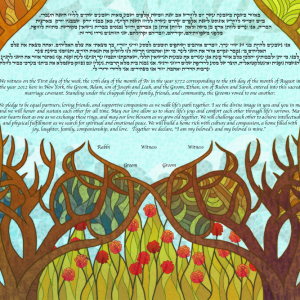 Skillfully blending color and emotion, this Ketubah is perfect for the couple who want to uniquely declare their love.